The subject and verb of a sentence must agree with each other. If the subject is singular, the verb should be singular and if the subject is plural, the verb should be plural. When two or more subjects are joined by ‘with’, ‘together with’, ‘as well as’, ‘like’, ‘unlike’, ‘besides’, ‘in addition to’, ‘along with’, ‘and not’, ‘rather than’, ‘no less than’, ‘except’, ‘nothing but’, the verb is according to the first subject. 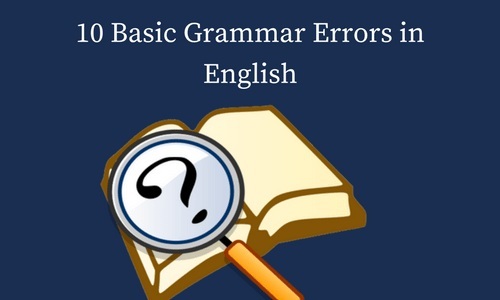 However, when the subjects are connected by ‘not only - but also’, ‘neither – nor’, ‘either – or’, ‘none – but’ the verb is according to the nearest subject. The use of apostrophe with ‘s’ is not correct in the case of non-living things. It is restricted only to living things, weight, time, distance, amount or personified nouns. Example: A rupee’s worth. Do not use Apostrophes after possessive pronoun such as my, mine, his, hers, our, its, their, theirs, or ours. With compound nouns apostrophe with ‘s’ should be added only with the last word. Example: Son-in-law’s behaviour. Possessive case is indicated by apostrophe without ‘s’ after Plural nouns or words ending with ‘s’. Example: Girls’ hostel. Most of the people are making mistake while using these two words. ‘Few’ is used for numbers. Example: there are few cakes left. 'Little’ is used for quantity that cannot count individually. Example: A little water in the glass. Affect is a verb, which means influence or have an impact on something. Example: Continuous attack of asthma has affected his health. Effect is used as a noun to refer the result of being affected by something Example: Excessive hard work in life had adverse effect on her health. Lose is a verb that means to be unable to find or fail to keep or hold or to fail. Example: Do not lose hope. Loose is an adjective, which means not tightly attached, like loose clothing. Compliment refers to an expression of praise (as a noun), or to express admiration for someone (as a verb). Example: I complimented my friend on her success. If something, ‘complements’ something, that means it completes it, enhances it, or makes it perfect. Example: Both husband and wife are complement to each other. Among is used for referring more than two persons or things. 8. Some nouns have one meaning in the singular and another in the plural. Air = atmosphere, Airs = proud. Good = wise, goods = property. Iron = metal, irons = fetters, chains. Content = satisfaction, contents = things contained. Authority = command, authorities = persons in power. Force = strength, forces = army. Earning = income, earnings = sowings. Family members is wrong; members of the family is correct. Mathematics teacher is wrong; the teacher of mathematics is correct. Cousin Brother or sister is wrong, only cousin is correct. Lecturership is wrong; Lectureship is correct. Boarding is wrong; boarding house is correct. ‘The two first’ is a meaningless expression for it implies that two things may be first. The correct form is ‘The first two’. ‘Only’ should place before the word it qualifies.